Talk about brand loyalty! Harold Hatch of Folkston, Ga., recently achieved the 100-cruise milestone when he boarded the Carnival Dream last week for a seven-day Caribbean cruise from Port Canaveral, Fla. Hatch began sailing with Carnival in 1999 and over the past 13 years has sailed on just about every ship in the “Fun Ship” fleet, totaling hundreds of days at sea. 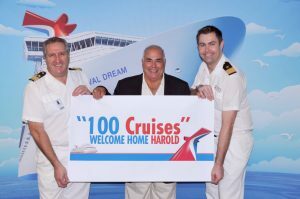 Hatch (center) is pictured with Carnival Dream Hotel Director Donato Becce (left) and Food Operations Manager Lars Juel. In recognition of the 100-cruise milestone, Hatch received a free cruise in recognition of his continued loyalty. Guests also receive a shipboard credit equal to 25-, 50- and 75-percent of their cruise fare when they sail on their 25th, 50th and 75th cruises, respectively. 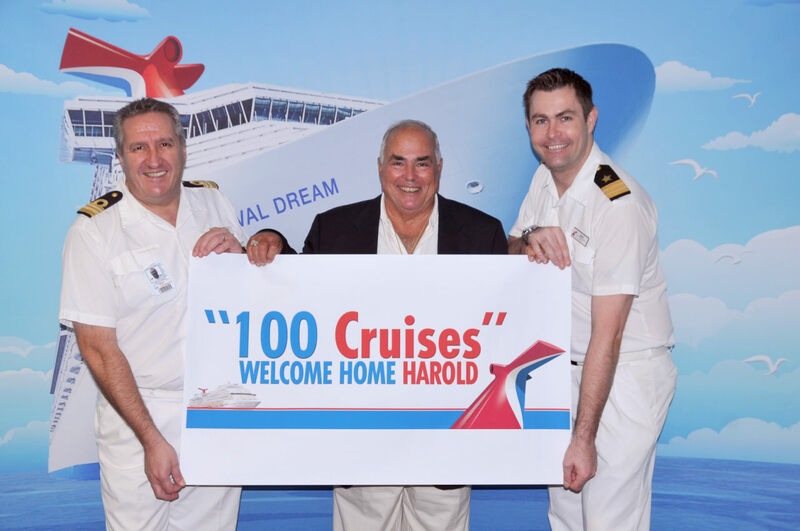 In fact, Hatch is already working toward the 200-cruise milestone as he is booked on back-to-back-to-back vacations aboard the Carnival Dream through the middle of December.